I’m going to share my make up routine with you. Last summer, I got rid of all of my make up and went natural. Did you know that make up has a shelf life? I didn’t remember when I bought what, so I just got rid of it all. I wanted to go natural because I didn’t like the feeling that I had to wear make up in order to feel comfortable in my skin. I didn’t want to buy into what society says is beautiful, and fall into the rabbit hole where advertisers clearly make their money from us women. When I decided to go natural it felt weird at first. The first week was uncomfortable but after a while it got easier. I would forget that I didn’t have make up on, until I saw my reflection in the mirror. Over time my skin got clearer. I felt comfortable going without make up and it made getting ready effortless. When I started my YouTube channel, in my first couple of videos, I didn’t wear any make up at all. I figured this is me and I want everyone to see me as I am. After a while I did a few sit down videos where I was primarily talking to the camera, and that’s when I decided to start wearing make up again. I wanted to look a little bit more presentable for those sit down videos. Now, I had thrown out all of my make up months ago. Instead of going back to the brand I used previously I decided to do my research on natural and healthy make up brands. As I did my research I found a handful and narrowed it down to Tarte Cosmetics. I decided to go with Tarte because I liked that the make up was oil-free and made in the U.S.A. They are also cruelty free and don’t use the following parabens, mineral oil, phthalates, triclosan, sodium laurel sulfate, and gluten. I went to the Ulta near my home and spoke with one of their specialists. She guided me to the Tarte products, and helped me find the best color for my skin tone. I am so thankful that she did because I was very happy with my purchase. I continue to use the same products to this day. This is not a sponsored post. I just wanted to share my experience. Going from natural to finding a healthy make up brand that works for me. Now I don’t wear make up everyday. Just every once in a while for a special occasion. Or for when I shoot a sit down video for my youtube channel. Other than that I go natural. I use a total of four products on my face. Yep. I said four. They are listed below. I hope you enjoyed reading this blog post. What make up brands do you use? 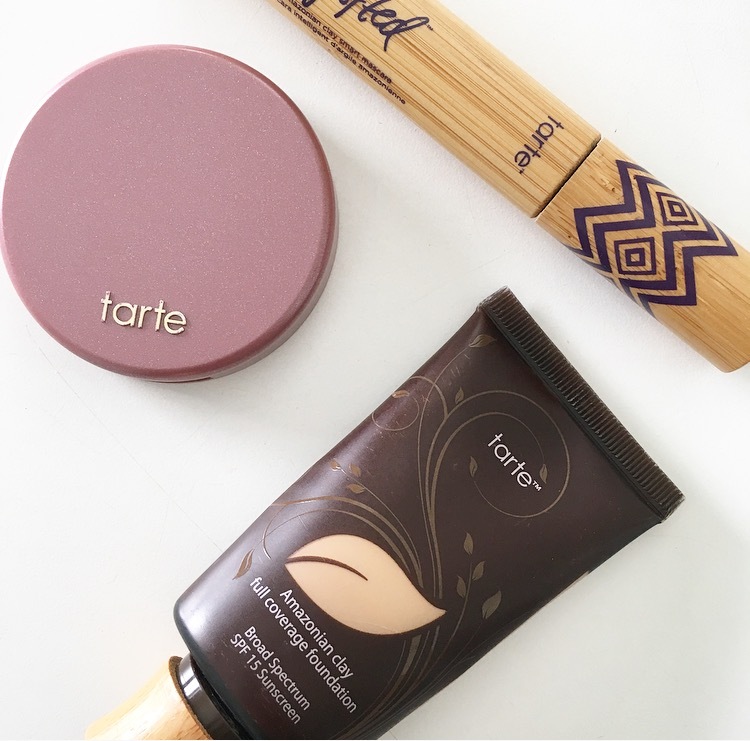 Do you use Tarte? If so, whats your favorite product? For more of my routines see my Hair Care Routine and or my Nail Care Routine.